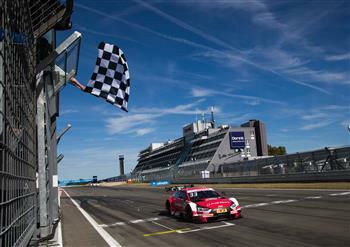 Head of Audi Motorsport Dieter Gass: "Fantastic for René, fantastic for Audi"
Nürburg, September 9, 2018 – Audi driver René Rast achieved the perfect DTM weekend at the Nürburgring: The defending champion claimed pole position and victory on both the Saturday and Sunday. As a result, he scored the maximum possible points with his Audi RS 5 DTM and moved up to third overall in the overall standings. Rast made yet another perfect start from pole position. On the opening lap he cleverly held Gary Paffett behind him, before making good his escape and subsequently benefitting from the skirmishes in the chasing pack. After all the pit stops had been made, the German from Audi Sport Team Rosberg held a lead of over eight seconds, which he managed to the flag. Rast took the checkered flag 2.739 seconds ahead of current second placed championship contender Paul Di Resta in a Mercedes-Benz. Afterwards he was presented the winner's trophy by FIA President Jean Todt. "The race was just as hard as it was on Saturday," said Rast. "I really had to fight hard with the car in the end. But we took the maximum points haul and third place in the championship. It was an unbelievable weekend with two poles and two wins. I'm stuck for words!" "It's absolutely incredible, I'm speechless as well," said Head of Audi Motorsport Dieter Gass. "Two wins and two pole positions for René (Rast) – I don't know how he does it. Obviously it's fantastic for René, but also fantastic for Audi. After the difficult start to the season we couldn't really expect this. We never gave up and improved the car little by little within the confines of the limited possibilities that the regulations allow." With Robin Frijns from Audi Sport Team Abt Sportsline another Audi driver scored points in the Sunday's race. The Dutchman fought from the last row of the grid to 10th position. In the process he benefitted from innumerable skirmishes and collisions through which four of his stablemates – Loïc Duval, Mike Rockenfeller, Nico Müller and Jamie Green – also dropped back down the running order. They finished 11th, 12th, 13th and 15th respectively. 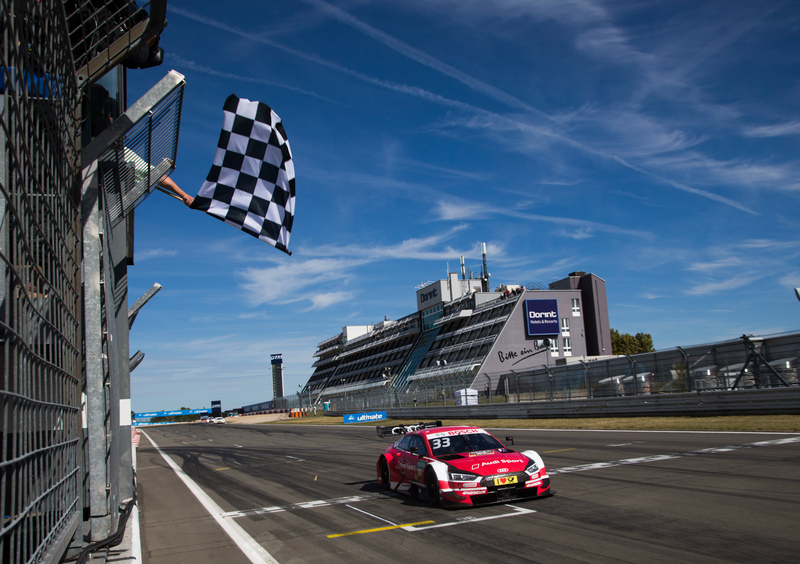 Audi driver René Rast dominated the DTM round at the Nu¨rburgring over the weekend, taking pole position and winning on both Saturday and Sunday for a record point haul.